A few months ago I had an idea. A few weeks ago I proposed this idea to the folks that run Smorgasburg. Then I told my idea to Neil from Lumpia/Adobo Shack and we ended up creating this. Then THIS started to get people excited. So the time has finally come. 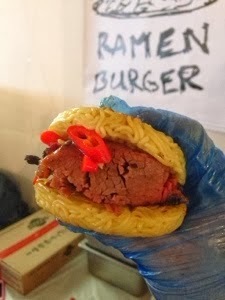 This weekend (starting tomorrow), anyone can buy my ramen bun and then take it to Adobo Shack to get the limited edition Adobo Shack Ramen Burger. And yes, this won't be the only mashup. Several other vendors will be mashing up their items too. Who knows, their might be some secret mashups as well, so don't be afraid to ask!